One good thing about Bluehost is, it offers one free domain with who.is guard, so you don’t need to use additional domain registrar to buy the domain. If you already have a domain name with you, you can use that to sign up for Bluehost, and use free domain feature later on. You can get special discount on Bluehost when you sign up from below link. Simply follow above Bluehost signup link, and you will be on Bluehost signup page. On the next page, you need to select the hosting package that you want to buy. 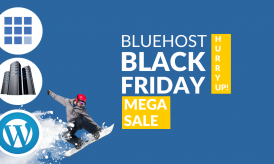 Let me quickly explain the major different of all the three Bluehost plans. 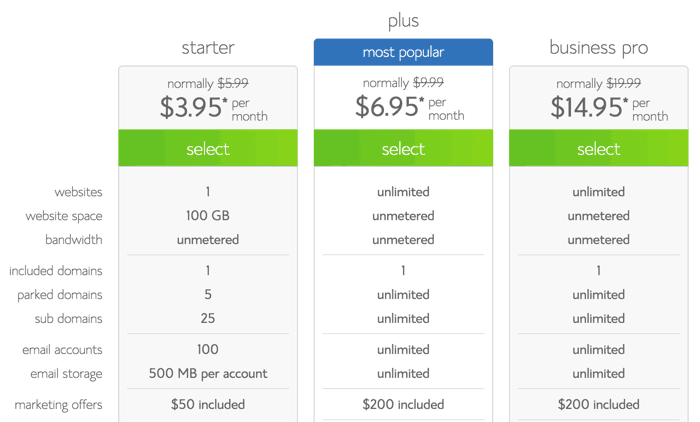 Starter hosting package: This is the cheapest which cost $3.95/month & let you host one Website. Offers 100GB storage & unlimited bandwidth. This is good for you when you plan to host only one site. Plus hosting package: This is what I would recommend for you as there is only $3/month difference than Starter package, as it offers all the features + let you host unlimited sites. Moreover, unlimited resources are icing on the cake. 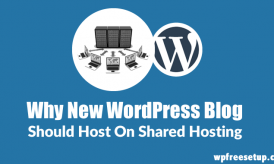 Personally, this is what I use for hosting my sites on Bluehost. Business Pro: This is great for those businesses who need SSL certificate. This plan has all the features of Plus hosting + Dedicated I.P, SSL certificate & few more. The price difference is about $8, and you will get what you pay for. This plan is recommended for business or eCommerce sites. For a WordPress blog or informative kind of website, you should prefer the plus package. Click on select under your preferred plan & on the next page you can claim your free domain or use any of your existing domain as the primary domain for this hosting account. You can anytime use the free domain offer in near future. You can buy the domain name from Bluehost (First year is free), or you can add your existing domain name in the “I have domain name” field. In my case, I will be using Bluehost free domain name feature. 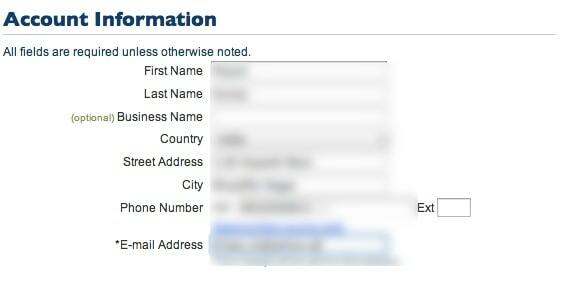 Click on Next, and it will take you to Bluehost account information, and payment page. Fill out all the details, and make sure your details are accurate. Now, select the package that you want to buy. Whenever I buy shared hosting from Bluehost, I opt for three years plan, as I get it for as low as $6.95/month for the plus package. 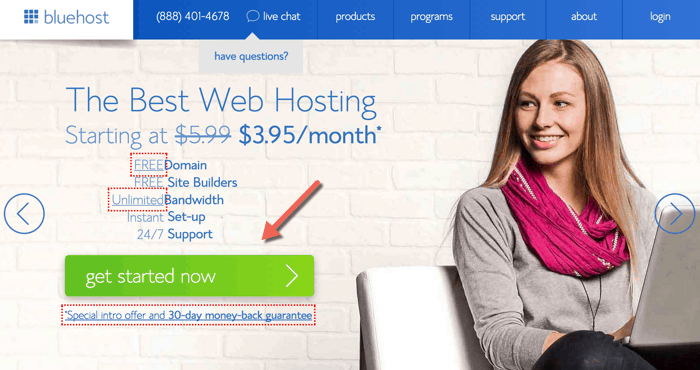 Since Bluehost is an old and reliable WordPress hosting company, this investment is better than paying next year renewal fees with no discount. When you are filling up the package information column, if you taking your website backup somewhere else, then do uncheck site backup pro. As, we don’t need them with WordPress blog for now. Once you have filled all the details, go ahead and make the payment. You can make Payment via Credit card or PayPal account. Once your payment is processed, in few minutes you will be receiving your Bluehost login details. 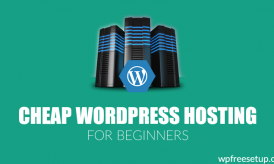 Now, login to your Bluehost cPanel, and install WordPress on it. If you still have any query before buying Webhosting, do let me know via comments. Thank you for sharing this informative Article. 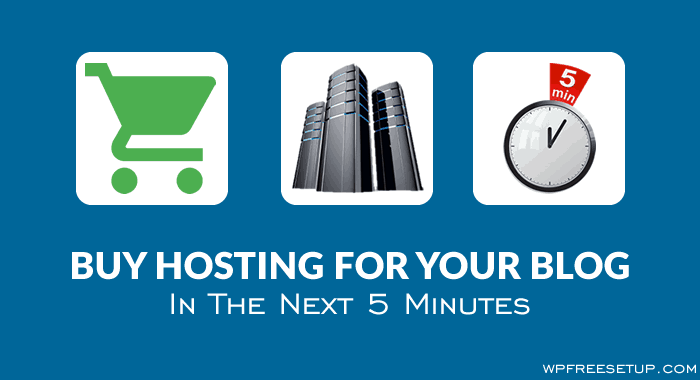 I have already purchased hosting from Bluehost and i must say Bluehost is best. I got awesome support after sale. I wish I could visit this blog before I purchased the domain and hosting, I must have received a great discount you are offering. I will highly recommend Bluehost to all. Great post! Really this one very useful for me, I decided to move my all sites on Bluehost. But Sir, Can you tell me the process to buy host from them, as i’m Indian and don’t have credit card. I have ICICI debit card. Can I pay through Paypal by using my ICICI debit card? Starting with BlueHost or HostGator is the right decision when starting. I use those servers for couple of years and finally now moved to DigitalOcean VPS. Because it is unmanaged VPS, it might be harder for newbies, but we have server pilot to ease the process. A $5/month is truly great price for moderate sized blogs! I am yet to start a blog, and am gathering information before I can start. I have seen the Indian version of bluehost and hostgator also providing hosting services. What is the difference between purchasing hosting from the Indian websites and the other ones (like the link provided by you in the above post). What would you suggest to someone who is just starting off. Do they provide good support?